Having a fish pond set up in your backyard or workplace is a wonderful feature sure to make you the envy of your friends. A well constructed and maintained pond is a delightful addition to a garden area and is also a very easy way to keep fish. Choose a position away from large Gum or deciduous tree. The leaves that will fall into the pond have to be removed constantly. Full sun isn’t a good spot for a pond. Ideally the pond will be positioned where it receives enough light, but not the afternoon sun. Consider that electricity is needed for powering a pond pump. Beware of buying a shallow, pre-cast pond. In the summertime your fish will struggle with high temperatures that will leave very little oxygen for them to breathe. You should be aiming for a minimum 80cm depth, even deeper is better again. This does a couple of things.. it gives the fish protection from predators such as birds of prey and cats as well as a cooler area at the bottom for extreme heat during our ever increasing hotter summer conditions. Design the pond to the appropriate shape for the space you have, but consider the following… Good practice is to allow a “ledge” right around the rim where perhaps some potted plants can be positioned as a border for the pond’s water. 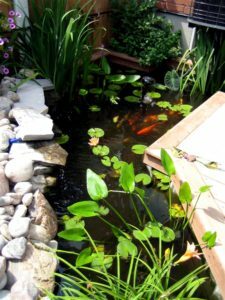 One thing you will learn during this article is the necessity for plants, as well as fish in your pond. The idea is to create a balanced ecosystem that is almost self sufficient. There are different opinions about how to propagate plants in the pond. Some say in some gravel substrate at the bottom of the pond, others argue that substrate at the bottom holds fish poo, or what we call detritus, therefore it may be better to have potted plants. Personally, I recommend potting your plants as a far better option – especially to think that they can be easily removed for maintenance purposes without disturbing the plant too much. Either way plants in the pond are very useful to absorb phosphates and nitrates from the water. Phosphates and nitrates are what cause your algae or “green water.” Plants also offer shade and protection for your fish as well as competing with algae for valuable sunlight. It has been suggested to add plants a week prior to the fish but certainly not necessary. In South Australia, Valisneria is a commonly used water plant, as are water lettuce, duckweed and water lillies. Agitating the water is a very important aspect for a successful pond – particularily in the warmer months. Water movement allows Carbon Dioxide out and Oxygen into the water. Consider that during the day plants give off oxygen through photosynthesis, but by night they take in oxygen through respiration. Therefore, particularly on a still night with no wind at all, it is extremely important to run the pump at this time, and even more important if your fish pond is full of plants. Not only this, within the sponge of the pond pump’s filter grow beneficial bacteria that helps to break down detritus into nitrates by growing colonies of that are in turn absorbed by the plants. Generally the pond pump should be left to run all the time in the warmer months, during cooler months the pumps use can certainly be relaxed. Goldfish – Breeds such as the Comet, Fantail, Nymph, Shubunkin and Black Moor are all suitable for an outside pond. Native Australian Fish – Breeds such as Silver Perch, Golden Perch, Murray River Rainbow, Tandanus Catfish, Murray Cod. Native Crustaceans – Yabbies are also popular inhabitant in many backyard ponds – and yes they can live with other fish in the pond. 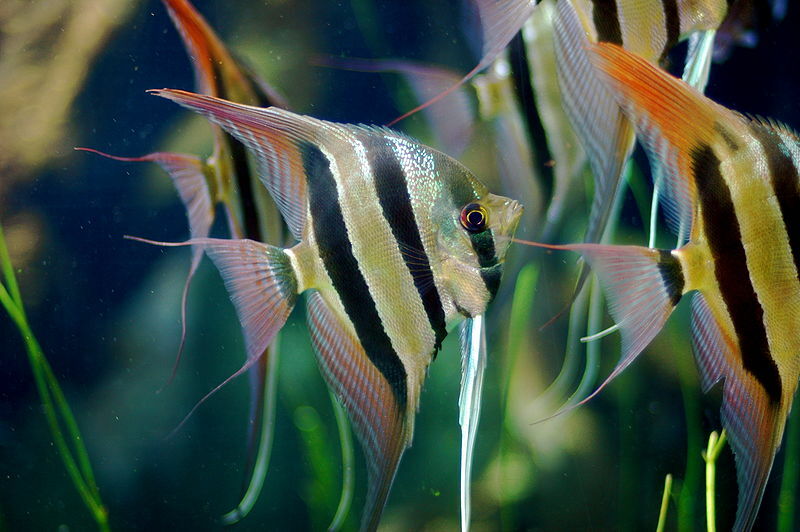 Exotic Fish other than Goldfish – Includes small varieties such as Golden Medaka and more common the terrific little White Clouds. I get many complaints from customers who tell of their ponds going a bright green colour, and they “Can’t see their fish anymore.”. This of course is the effect of growing algae in their ponds. Green algae is the product of water, excess sunlight and excess nutrients. Sometimes I will sell a customer an algaecide as there is little alternative, but most of the time I find myself educating these customers on how to look after a fish pond in a manner that discourages algae growth. I want to emphasize the term “nutrient”s for just a moment, because this seems to overlooked by a number of people and I want to set the record straight. To reduce “nutrients” in the pond, it is a simple as reducing the amount of food you feed the fish in the pond! If you feed fish an extraordinary amount of fish food on a daily basis, the the fish are sure to produce an increased amount of fish waste. So how much do I feed my fish in my pond I hear you ask ? Well in the winter, your fish are not very active, I would suggest once to twice a week at the most is ample (remember ponds make their own food with bugs and algae!) The amount you feed should be about the amount that can be consumed in around 60 seconds or so. I don’t like to tell customers “a pinch” due to some people “pinches” being a massive amount of flake food that they can fit between thumb and finger. So try to ensure ALL the food is gone somewhere between 30-60 seconds after they have begun eating. In the warmer months, particularly in Southern Australia where from October to March the pond water can be very warm indeed, your goldfish in the pond will be quite active. In fact this is also the time when you fish will spawn. However to this I do not want you to start feeding everyday – your goldfish will not eat the algae that will be busy accelerating its growth with the increased sunlight, more I would like you to feed your fish every second to third day. And don’t over compensate by “double dosing” on fish food cause your fish have skipped a day or two, we want the fish to be a little bit hungry so they keep things like mosquitoes and algae down to an absolute minimum – and they won’t do that if their bellies are full ! Leading up to Christmas Day in December is the time your goldfish will breed – due to the warmer water. Certainly feeding can be slightly increased at this time for the gravid females holding eggs, but don’t over do it. Also – I want you to understand, if you buy “cheap” fish foods from the supermarket, then these foods are notorious for being high in waste and low in nutrition for your fish and a major contributor to poor water quality in your pond, not to mention poor health for your fish. A quality fish food is going to have your fish keenly swimming towards it and when it is actually eaten you might notice it will not be “spat out” repeatedly. The fish will digest and absorb quality food effectively, essentially creating less fish waste at the bottom of your pond – not to mention better health for the fish !! In fact a very common problem we see in goldfish is constipation. This is usually from overfeeding your fish (however a greedy fish is after all a greedy fish.) But a constipated goldfish is easily spotted with a swollen stomach region and an inability to stay upright – as if it has lost its buoyancy. The constipation problem can be corrected by removing the affected fish in a bucket of its existing pond water (other fish commonly “pick at” a sick or injured fish) and then starve the fish for 5 days before attempting to feed it something green and soft like the fleshy inside of a boiled pea. Doesn’t always work but most of the time I see positive results. PLEASE NOTE: There is no requirement to fence a fish pond in South Australia, however it is recommended that you place solid mesh or similar type material either on the surface of the pond, or to a depth of 300mm from the water level of the pond to prevent drownings. Supervise young children around your pond at all times.